Traditionally speaking, Persians consider snacks of such things as a mixture of nuts, seeds, dried fruits and raisins; fresh seasonal fruits at the end of a meal; and sips of tea sweetened with either sugar cubes or nabat (rock candy) or else with nibbles of dates or dried figs; as sufficient indulgence and cure for the sweet tooth. There really is no authentic culinary tradition of ‘dessert’ in Iranian cooking: cakes, cookies and pastries, often purchased from ‘ghanadi’ (pastry shops) instead of being made at home, used to be strictly reserved for company and festive gatherings such as the new year celebration and weddings. Which explains why Iranian cuisine, so rich and inventive in many ways, is somewhat paltry when it comes to a repertory of desserts. As you might have guessed from its English name by now, sholez zard gets its sunny disposition from saffron; its aromatic scent from rosewater (and butter); its wonderful smooshy texture from rice; and for its soft but not blandly mushy texture, sholeh zard owes a debt of gratitude to the crunchy almonds. 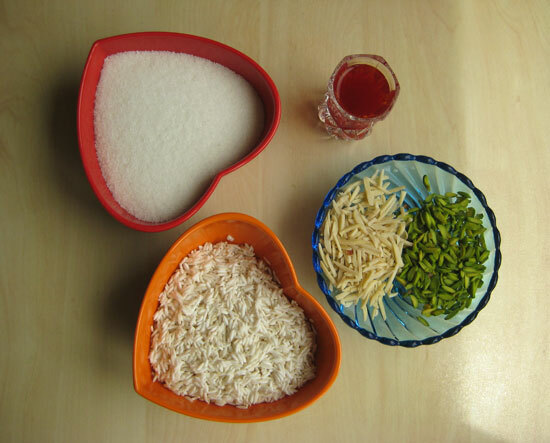 Interestingly of note re the rice: Persians take pains in preparing rice so as to get a nice and fluffy bed of rice, each holy grain lengthened and puffed up to its personal best (an elaborate process attested to and detailed in the ‘How to make the perfect Persian rice” post) and yet, when making sholeh zard, the object of the game is to practically cook the rice to smithereens and mush it up and mush it up good. Take that, finicky Persian rice! Payback time! GAME ON! 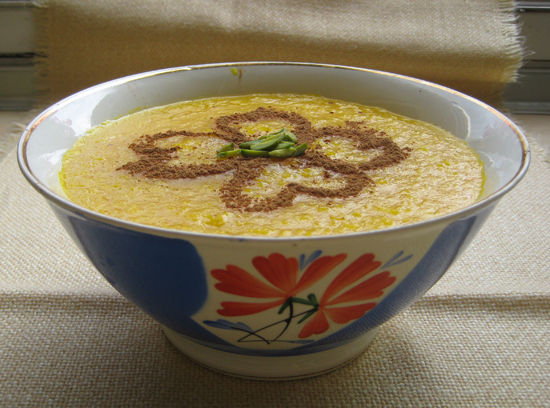 Sholeh zard may of course be served at Persian dinner parties and festive celebrations. But just like halva, its rival and oftentimes counterpart-companion dessert, sholeh zard is a sweet that also has somber and solemn associations. People of faith, when praying for something specific, sometimes make private personal vows ( called a ‘nazr‘) that should their prayer be answered, they would make charitable offerings of food (called a ‘nazri‘) to the needy — this may cynically be considered a quid-pro-quo barter, or, it may be considered a way to demonstrate good faith and gratitude to the almighty. This avowed charitable food offering may be as elaborate as a feast or as bare bones as tea and dates. Either halva or sholeh zard are almost always among the ‘nazri’ food thus offered. Wash and rinse rice thoroughly until the water runs clear, then drain. In a big pot, boil rice with 10-12 cups of water. Remove any foam. Once rice has cooked and softened completely, add sugar. Stir well with a wooden spoon to combine and dissolve the sugar. Once sugar has dissolved, add almonds, saffron, butter and rosewater. Stir well to mix all ingredients. Remove pot from heat. While still hot, transfer the pudding to one or more serving bowls, allowing it to cool and set. Note: For best results, use the best quality of rice. The sweetness of this pudding can be adjusted by using more or less sugar to taste. 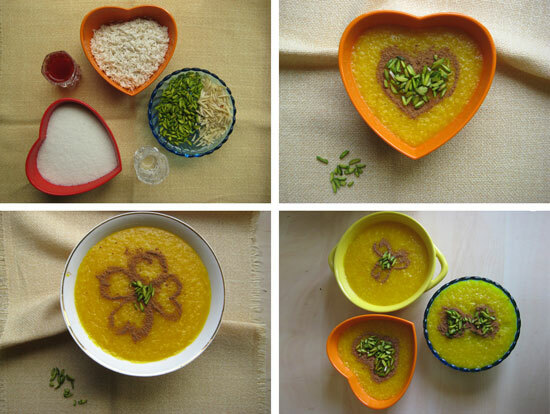 Once the Persian saffron rice pudding has cooled off and its texture set, decorate with a personally favored flourish of pistachio, almond and cinnamon sprinkled on top. Serve to your hungry and grateful gang. Tell them to bring spoons. 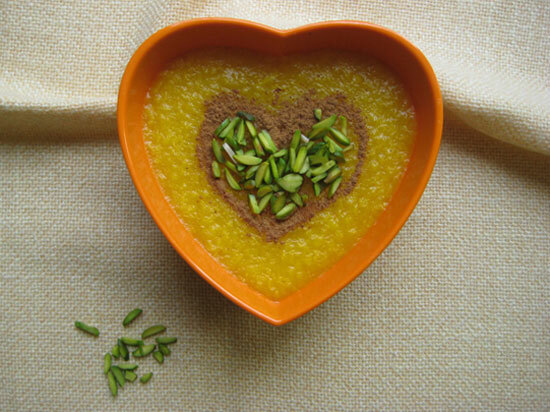 Of special note to fellow shakamoos: the top layer of the Persian saffron rice pudding is the best part! Thank you Haleh joon for feeding me yummy شله زرد and making this recipe a possibility! And hugs & kisses for this adorable sous chef! Awesome!! I have so many great memories of sholeh zard it was always around growing up. Such a satisfying dish! This is lovely, Azita joon. I shared my mom’s recipe for Persian New Year and found it a very difficult one to photograph. Your pics are beautiful! 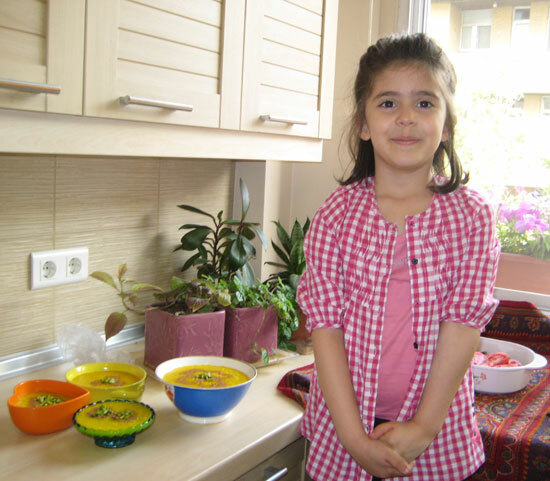 Loved your Sunny post about Sholeh Zard, dear Coco! Of course, that’s classic version of rice pudding in the West, no? We make a version that way but w/out saffron and it’s called ‘shir berenj’ (I posted about it ages ago) I do love the idea of adding saffron to it! Will try it at least once w/your suggestion. I think I probably did it wrong but in retrospect I don’t think saffron should have been added. I did a fusion shir berenj sholeh zard. Sounds like the most wonderfully, fragrant rice pudding Azita! It surely does smell good, Margot jan, I won’t deny! Oh Azita, this is so beautiful and meaningful. I love the hearts. Saffron to me is like gold so to have a dessert that has meaning, made with gold, wow. It’s so beautiful. The ingredients are so rich I would love to try this. xo. My friend had such a well stocked kitchen, It was a food bloggers dream! It was like, ‘you need props?’ here, check out this, this, this and that drawer, each filled w/ cool and interesting dishes! Score! Do try this Amanda joon, it’s particularly good on a cool day! Ah, that’s how you found me! I already passed on link of your awesome site to my sis. And yes, that’s one of the things I really personally enjoy about the Persian cuisine as well: using ingredients that one ordinarily would solely associate with sweet dishes and using them in savory dishes and vice versa! A fantastic tasty dessert recipe! I loved it & made it already 2 times! Lovely helper too!